I'm a beauty junkie, most of you know that by now. I stay on the lookout for new beauty products. 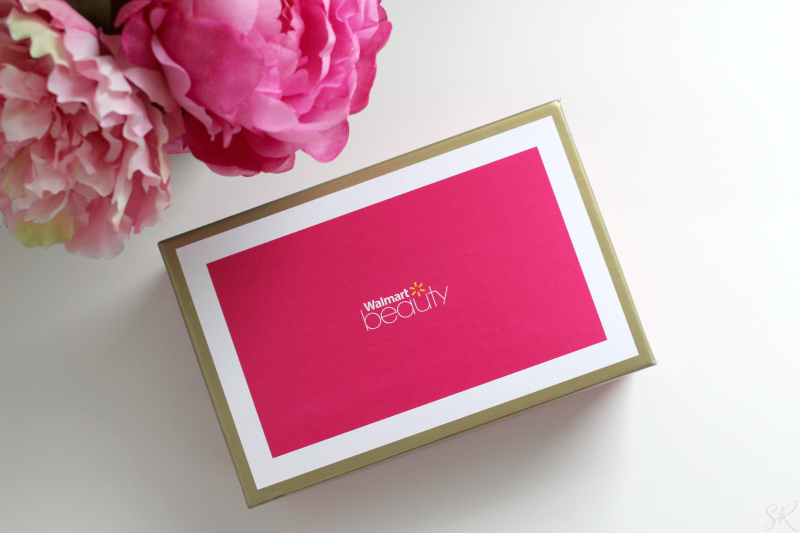 I've tried a few beauty box subscriptions but they can sometimes be expensive. So when I come across affordable beauty box, I try to jump on it. A friend had mentioned months ago that she tried the $5 Walmart Beauty Box and I was intrigued but never ordered one. I've tried the Target beauty box that I tried twice but they are first come first served so I always miss out on the good ones. 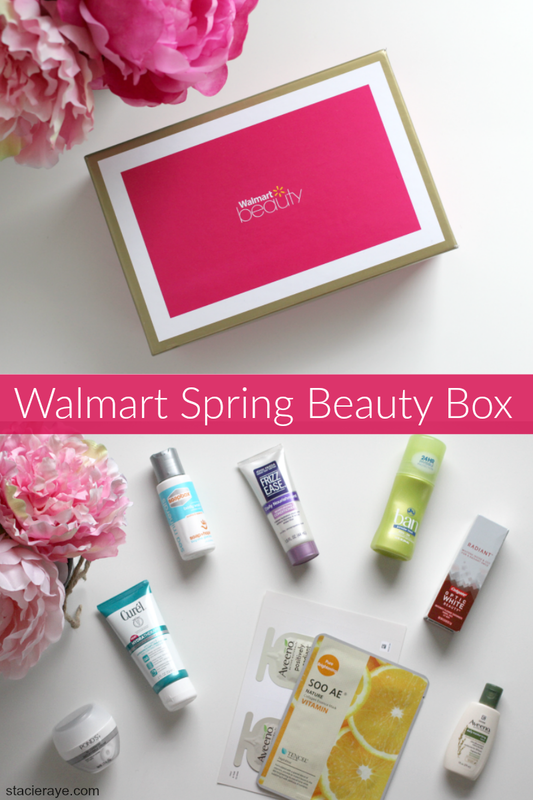 Recently, I saw everyone posting their new spring beauty boxes from Walmart so I decided to head to the website and check it out. I signed up and gladly paid my $5 shipping fee. I never received a email confirmation so I really didn't know what to expect. A few days went by and still no confirmation email, just a "pending status" on the website. I figured that I may have missed this season's box. To my surprise, I got my box in the mail the day before Easter. First, I have to say that I love the packaging! Y'all know I love anything pink. 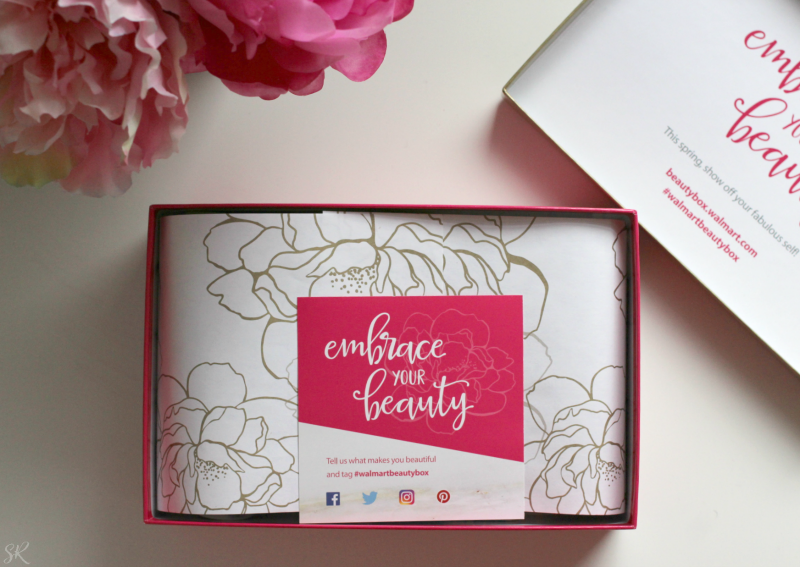 This Walmart Spring box's theme is all about Embracing Your Beauty. I'm am definitely here for that! When I opened my box I noticed that the beauty samples I received were a bit different from what I saw others get. I think it's because I ordered the box late and the best beauty samples were all gone. I received a total of nine samples and a few coupons for the items inside. 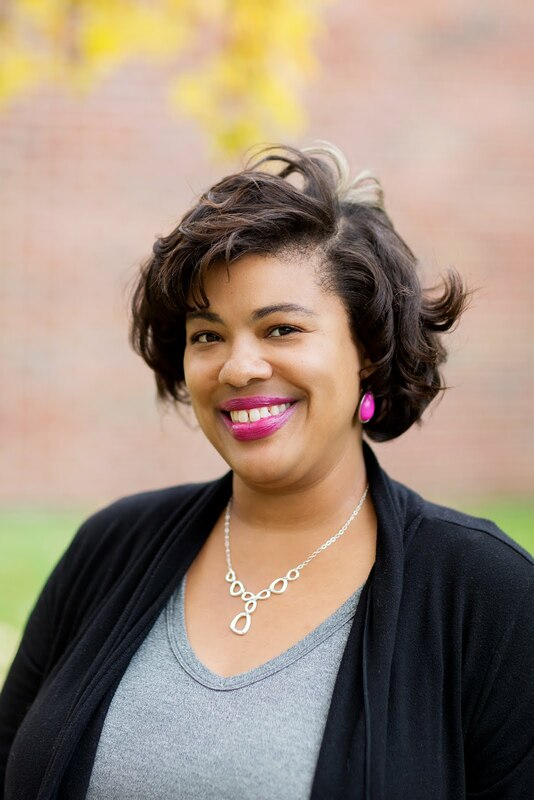 I was pleased with the Colgate Optic White Beauty toothpaste. Let's see if it makes my teeth pretty and white. The Soap Box body wash was very plain. It didn't lather as much as I would have liked it to and there was really know scent to it. 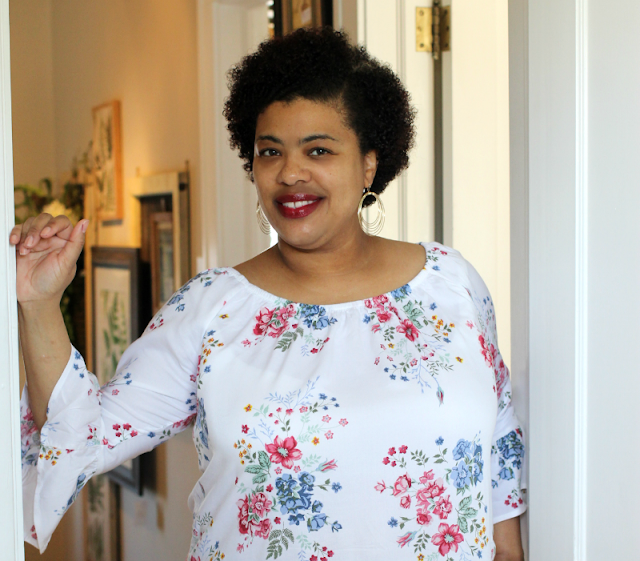 I tried the Curel Wet Skin moisturizers and I have to be honest, it's not for me. I generally don't like applying moisturizer while my skin is wet. This stuff was slipping and sliding everywhere! You definitely need to pat yourself dry before trying this. The Ban antiperspirant/deodorant took a while to dry. I'll use this as a back up deodorant but I wouldn't buy it. I've already tried the Aveeno lotion. I think anyone with dry skin has used this one before. I plan to try the Frizz Ease, Ponds and the Vitamin Mask another day. Although these samples weren't the greatest, I would purchase this beauty box again because it's a cheap way to try out new products. 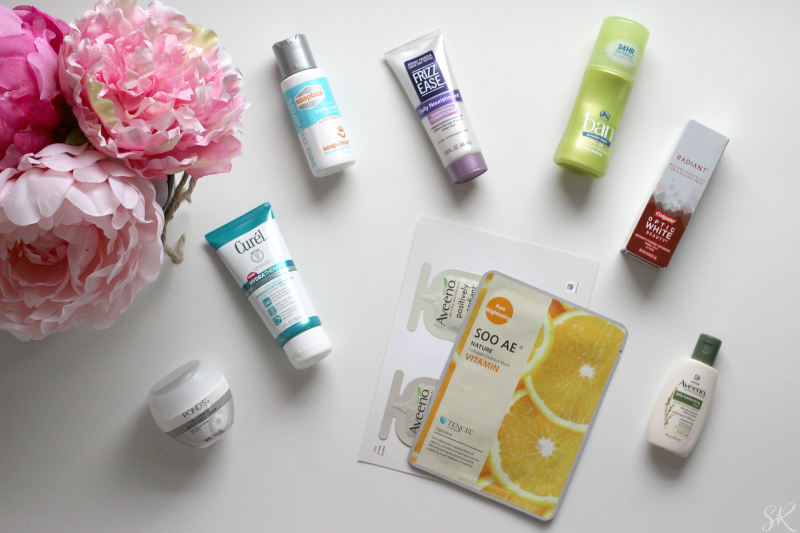 Have you tried the Walmart Beauty Box yet? The packaging is adorable! There's a lot of products inside that little box! In the past Aveeno was one of my favorite brands. They make really nice products especially that lotion, like you said anyone with dry skin has likely used that lol. Thanks for sharing! I never tried the walmart box. I've subscribed to tipsy in the past and loved it. That $5 is definitely hard to resist. It's true what you said about that Ban anti-perspirant. I'm using it right now and I definitely have to put on a few minutes before I want to actually put on my shirt to give it time to dry. Although I am not a Walmart fan, I have to respect their ability to keep abreast of the trends. The packaging of the box is beautiful. Thank you for your honest commentary. Your photos are beautiful! I was very pleased with my box too. I love what you have here. I would love to try it. I love these boxes that are coming out we don't have to rely solely on ipsy anymore! There are so many useful products inside that box. Great product review thanks for sharing. I used to subsribe to the Walmart Box but decided to cut back on subscription services. Now, I only have the Play by Sepora bag and I loooove it! Oh wow! I didn't know Walmart had a beauty box. It looks so lovely. Aveeno is a good skincare product. I would definitely use it. Some how I missed that Walmart has a beauty box. I may actually try this one. I use many of the products in the box you shared. The packaging is very cute! I've heard of this before but keep forgetting to check it out for myself! I like that you get so many samples though. I had no idea WalMart even had a beauty box. The presentation was on point. I'm a pink lover as well. It's a great bang for your buck. As a non-beauty person but a skin care person this box is right on time. The packaging is cute too. Walmart has a beauty box! I had no idea. It looks like they provide great samples. I will need to check it out. Thanks for sharing. 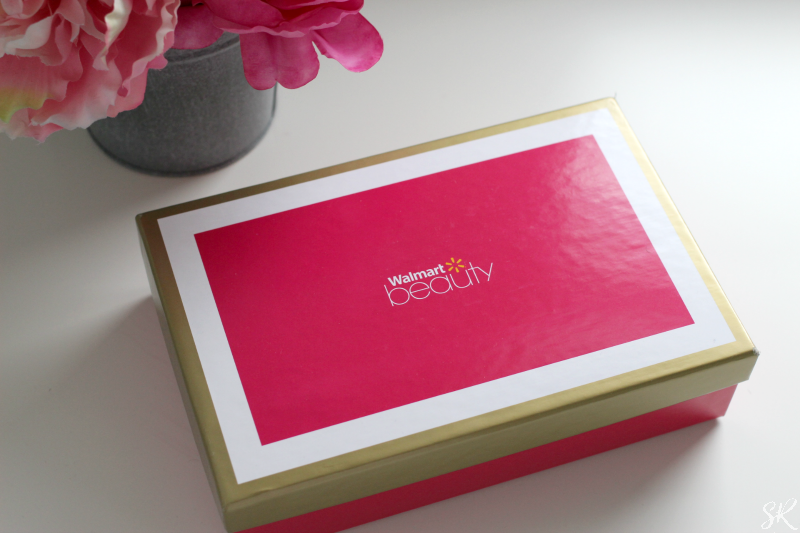 I've ordered the Walmart Beauty Box before and I really liked what was in it. This time I ordered the two Target Beauty boxes that were offered. Cute packaging as well. I'm with you: inexpensive boxes are the best treats. That is a lot of samples for a $5 box, great find! 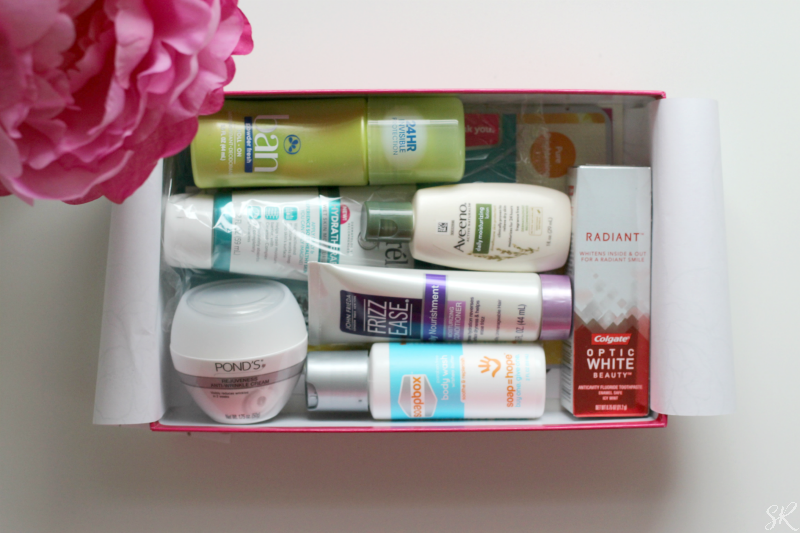 I'm not a huge fan of box subscriptions but I might give this one a try just to be introduced to some new products. I haven't tried this. In fact, this is my first time hearing about their box. I knew Target had one, but wow. I would love to try the Frizz Ease. I've always wanted to try their products. My hair gets super frizzy in the summer with the humidity. I have never tried out the Walmart box even though I keep hearing good things about it. I tried the Curel and liked it. It wasn't slippery for me in my shower, could be because of the type of tiles I have. I need to check into this box. Thanks for sharing about it girl!